1. Season both sides of chicken lightly with salt and pepper and put into crockpot. 2. In a small bowl, combine honey, soy sauce, onion, ketchup, oil, garlic and red pepper flakes. Pour over chicken. Cook on low for 3-4 hours or on high for 1 1/2 – 2 1/2 hours or just until chicken is cooked through. 3. 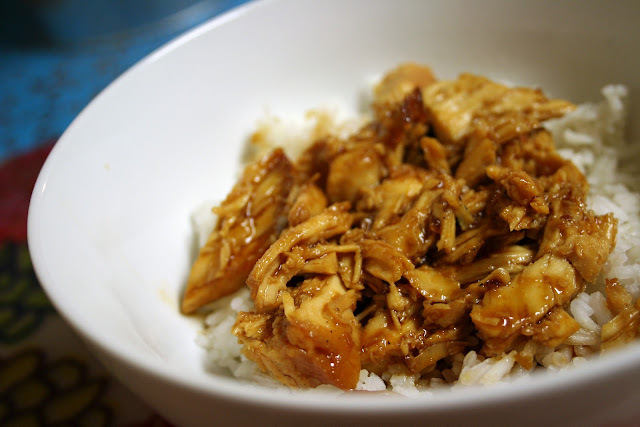 Remove chicken from crockpot and leave sauce. Dissolve 4 tsp. of cornstarch in 6 Tbsp. of water and pour into crockpot. Stir to combine with sauce. 4. Replace lid and cook sauce on high for ten more minutes or until sauce is slightly thickened. 5. Cut chicken into bite size pieces, return to pot and toss with sauce before serving. Sprinkle with sesame seeds and serve over rice.